Calling him "the best vice president America has ever had," President Barack Obama awarded Joe Biden the Presidential Medal of Freedom Thursday in a surprise tribute to his friend and close adviser for the last eight years. 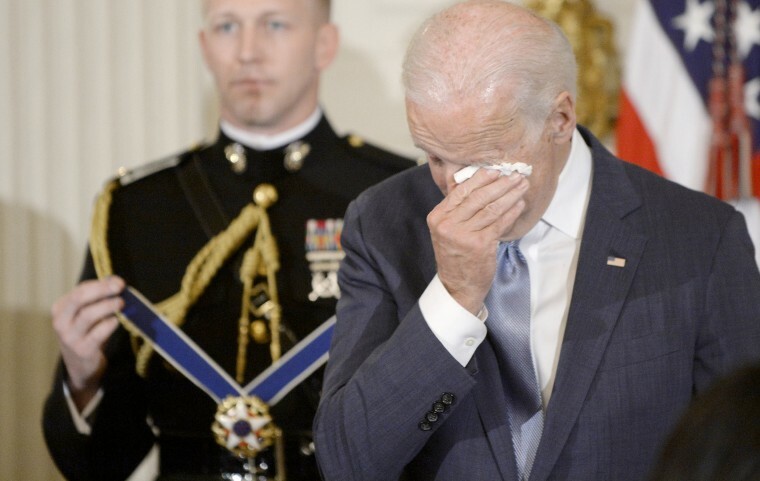 The medal is the highest civilian honor in the United States, and Biden appeared stunned and wiped away tears. When he took the podium, he started by jokingly telling his chief of staff "you’re fired," for not hinting at the surprise. "This honor is not only well beyond what I deserve, but it’s a reflection of the extent and generosity of your spirit,” Biden said. "I don’t deserve this. But I know it came from the president’s heart," he said. "There is a Talmudic saying that says what comes from the heart enters the heart. Mr. President, you have crept into our heart, you and your whole family." Obama awarded the medal "with distinction," an extra level of veneration, for the first time in his presidency. The previous three presidents awarded the higher level of the award to only one person each: John Paul II, President Ronald Reagan, and Gen. Colin Powell, Obama said. He called Biden "an extraordinary man, with an extraordinary career in public service." Biden said he "had no inkling" that the president was going to pay him tribute at the ceremony, which he believed was going to be a look back at the journey of the last eight years. "This is a remarkable man, and I just hope that the asterisk in history that is attached to my name when they talk about this presidency, is that I can say I was part of, part of the journey of a remarkable man who did remarkable things for this country," Biden said. It was Obama's idea to award Biden with the medal and to do it as a surprise, a senior official involved in the planning of Thursday’s event told NBC News. Planning was carried out by a small group of White House staff. Obama and Biden have developed a close friendship, which has been the inspiration of many online memes. The president even joked during Thursday's tribute: "This gives the internet one last chance to talk about our bromance."